Hey everyone!! I have been finalizing the last of the signs and labels for my classroom because, well, I’m going in to school this week! Thanks for all of your advice–I really enjoyed reading what everyone would do in the same situation! I decided IF I could manage to get the whole room set up, then I could really relax and enjoy the rest of the summer and plan away at home. 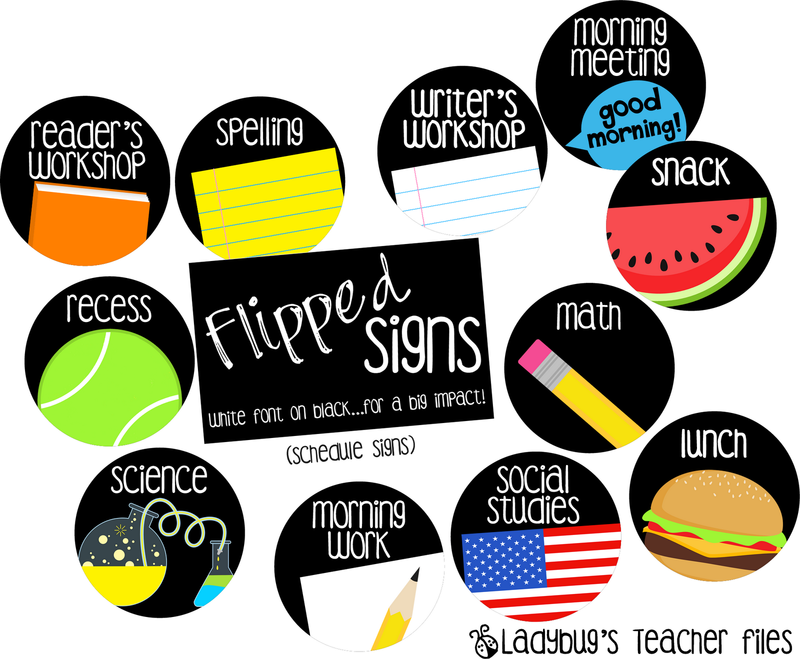 There are 27 different signs in these Schedule packets…I took all of your suggestions by email and messages (thank you!!) to make as much variety as possible. I also added in the free Special Signs shared previously, so everything is together in one bundle (no extra cost, just to make things convenient)…with some adjustments like “P.E.” and “Gym”, your choice when printing. The signs measure 6″ in diameter and are $2.50 in my TpT Store. If interested, please click on the green link just above. These are also listed in my TpT Store. 1. Your email name (so I can send it along to you). 2. Which one of the items (featured above) you would like. Thank you for reading and I hope you are all having a relaxing evening! I look forward to getting into school soon and sharing some photos on here (cross your fingers the hallways are waxed so I can get to my room!!!!). I would love the bright special signs! I love your flipped schedule signs! I'd like the first schedule signs! Love the schedule signs! I have been following your site this summer….love it! I love your special bright and clear signs! I love your schedule signs! So cute! 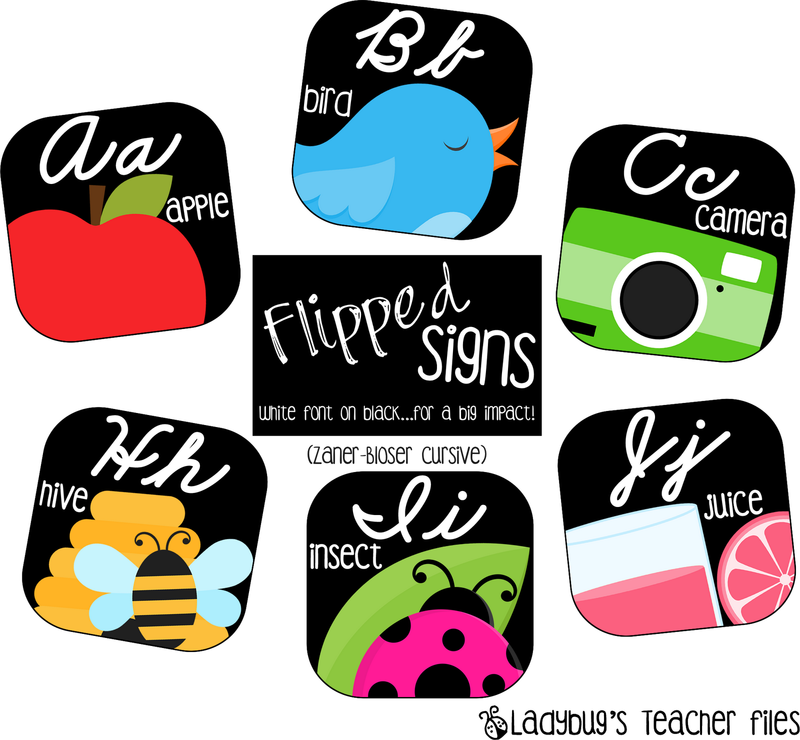 I'm starting my first year teaching and these would be perfect in my classroom! The schedule signs!!! Love your stuff!! Wonderful blog! Found it on Pinterest. Flipped schedule signs love them!! I absolutely love your bright and clear schedule signs!! They are adorable!! Love the flip signs as well! cannot wait to use them in my classroom this year! I think there are already 10, but just had to say how much I LOVE your designs. I'll likely be getting a set of those bright and clear schedule signs if I didn't get in in time. So cute! These are so great! You are very talented and creative. I think they would be a focal point in any classroom! I missed the top 10, but you are amazing! I love these!!!!! I love love love the bright and clear labels. I am totally going to pick those up and redo my schedule area. I totally need to know how you create these cute things. I need to make a circle for Mandarin Chinese to go with your schedule cards. My next project! These look great! I love this entire series. These look amazing (as usual)! Absolutely beautiful and quite professional my friend:))) Thinking I may need to be replacing my store bought alphabet to your flipped one:) LOVE! You are so talented!!! Ohmyword, Kristen! You are too wonderful! I am going to be in trouble when I go back to school because I have WAY too much stuff to print on our color printer! I never thought I'd call schedule signs beautiful, but yours totally are! Only problem is… I love the bright and clear AND the flipped ones… hmm big decision to make! Can't wait to see photos of your newly decorated classroom!! My my, you make it so hard! I love them all! I don't have any black in my room anymore and it really makes me rethink that. The flipped signs are gorgeous. Kristen- They are all awesome! It's so hard to pick which ones I want to purchase. YOU ROCK! Kristen, you are SO talented!! These are simply beautiful! And thank you for doing the alphabet line in D'Nealian! I'm on my way to get them NOW!! I love everything you make! What computer program do you use? Where do you get the fonts and clipart? Thank you so VERY much for the D'Nealian! LOVE everything! Darn I'm 40 comments to late. :/ Oh well I'll have to design which one I like best then fill your pockets! Love, love, love everything. I absolutely love your flipped signs! I purchased your alphabet ones, which I plan on using in my class library. I just love your style of graphics. 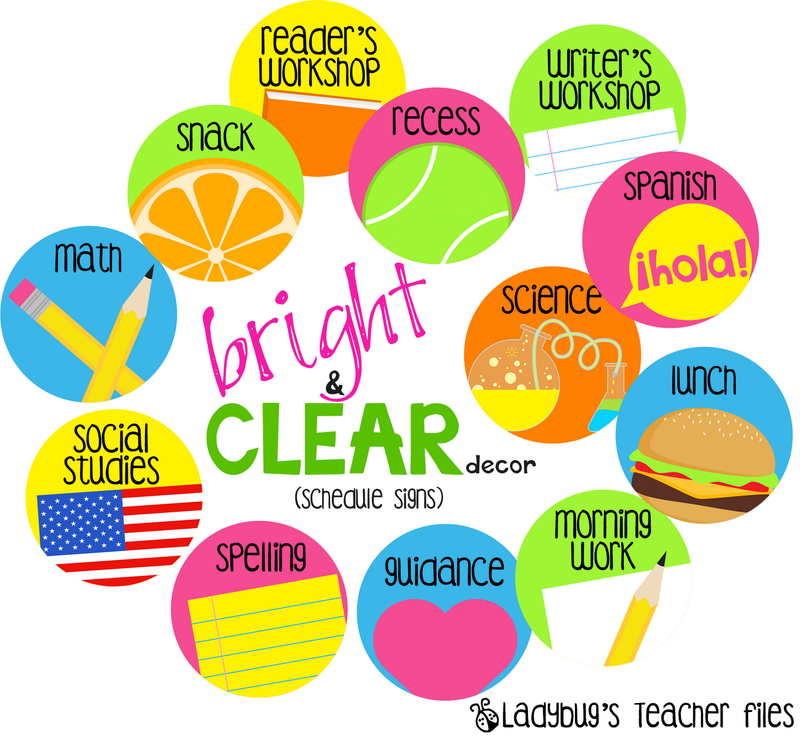 And like you, I love how circles look in the classroom. Would you be able to make your adorable alphabet line in d'nealian cursive. I am switching to third grade where I teach cursive and the d'nealian cursive alphabet lines are like impossible to find. Plus yours are SO CUTE! Thank you for considering this. You are just simply amazing. Love your stuff!!! I missed the top 10, but just wanted to say that these are beautiful!! I love all of them, but I think I'll be headed to your store to get the bright and clear! I have a black and white theme with a splash of color going on this year so the bright and clear will definitely add that splash of color! love it…did you see that Avery is making round lables…I wonder if these can be printed on those roundy things!??? I would love love love your bright and clear signs!! The colors are exactly what I am using this year! Thanks for sharing! Love your stuff!!! Love it!!! I just need a circle cutter thingamajig. I absolutely LOVE them all!!! I'm definitely going to have to head on over to your store. I'm awarding you The Versatile Blogger Award. Head over to my blog to check it out. I'm wayyyyyy late, as well, but I have purchases waiting in my cart from your Teacher's Notebook store! LOVE LOVE LOVE all of these signs!!! Can't wait to print them out and hang them in my room! I love the schedule signs. I need to make them bigger to cover a bad paint job in my room. Would you be silling to tell me what graphics sets you purchased to make them? Hello! I cannot tell you how awesome you are but you have to already know!! I need your help. We have a new specials called Humanities. Can I pay you to make one for me?!??!?!?!? Hi. I really like your signs. Is it possible to make one for SEL (social emotional learning)? Also, is there a way to make them smaller? I downloaded the black and white ones that say crayons, sharpened pencils, etc. and I think that is a perfect size. You are amazing! I am in desperate need of more schedule signs and also wanted days of the week to match. Of course at your cost. Please let me know! My email: reymurrell@aaps.k12.mi.us. Thank you! Hi and thanks so much! I'm sorry but I won't be able to take customized orders at this time, due to getting ready for my new school year. I'm very sorry, in an ideal world I would do this in a heartbeat! !